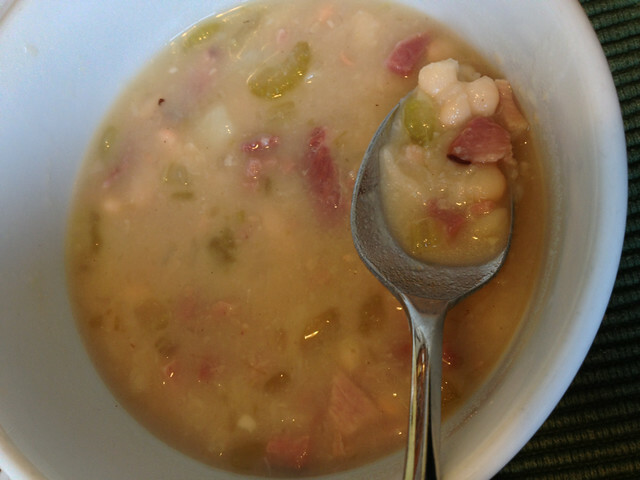 We have been making this soup for years whenever we have left over ham and a ham bone. It always tastes better the next day. Soak the rinsed beans overnight in cold water to cover by several inches. (we usually skip this as we aren’t thinking that much ahead. Just a couple of hours soak helps though if you have time). In a 5 to 6 quart pot, combine the drained beans, ham hock, and water. Cover and bring to a boil; adjust the heat, partially cover, and simmer briskly until the beans are tender, 1 to 1 1/2 hours, stirring occasionally. Stir in the onion, celery, garlic, potato, salt and pepper. Keep at a steady simmer another hour, stirring occasionally, until the beans are very tender and the soup is very thick.